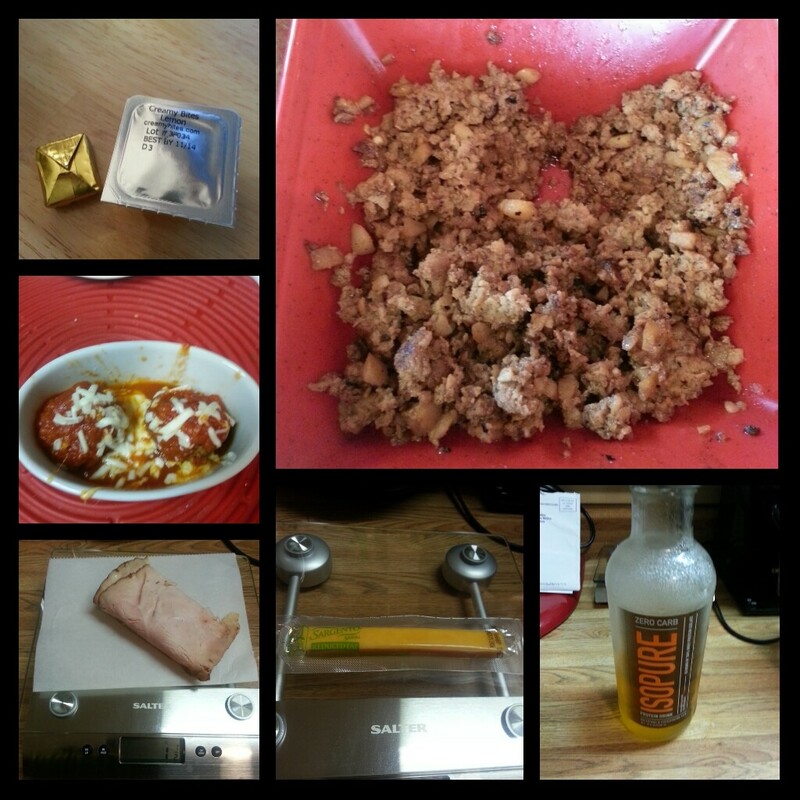 Today’s food choices, clockwise from upper left: multivitamin and calcium supplements x2; lettuce wrap innards from Genghis Grill (lunch and dinner); Isopure Zero Carb; Sargento 2% milk cheese stick; 1.5 ounces Boar’s Head Maple turkey slices; turkey meatballs in marinara with mozzarella (breakfast). 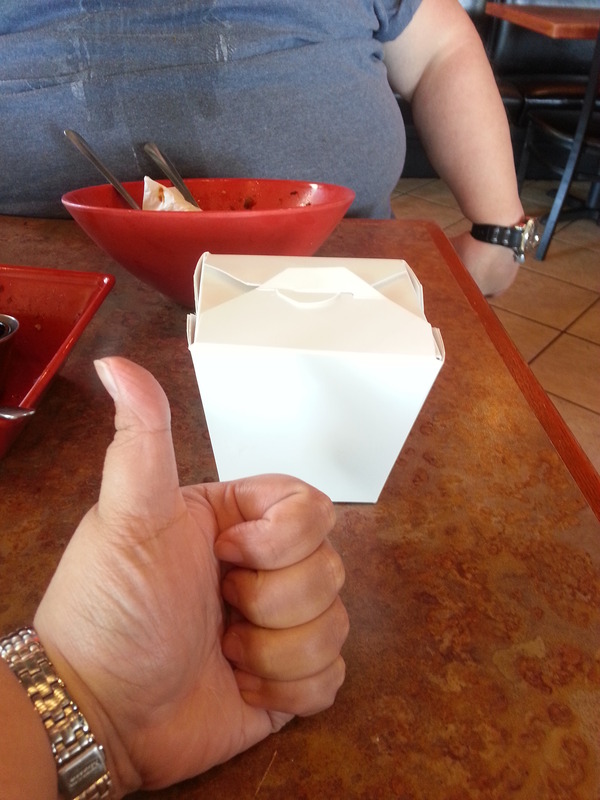 The Daily Bite today provided me a good topic to write about today: going out to eat post-op. There’s nothing in the house to eat (fridge is full). I’m too tired to cook. I’ll just stop on the way home and pick something up. We’ve been out and about all day and it’s getting late to cook so let’s just stop and get something. I will say this about our dining out patterns, though: we tend to frequent the same handful of places over and over again. We know the menu, we know the staff, and we know there are items we can choose that are healthy options. You see, my husband has several food allergies, so the types of things he can eat while we dine out are fairly limited. This is one main reason we have confined ourselves to a small handful of local restaurants that we patronize. One of the restaurants we frequent is Genghis Grill. If you aren’t familiar with GG, it is a Mongolian grill style restaurant where you get a stainless steel bowl, fill it with the protein and vegetables of your choice, season it with spices and sauces, and then a group of grill cooks prepares your bowl on a 650-degree grill that is in plain sight of all the diners. You can elect to have your creation served over one of 5 different starches, or not. And if you like, you can go back as many times as you like! It’s a pretty neat concept, if that’s your thing. Prior to surgery, we would go every Saturday, get a bowl (and I would get potstickers) and a drink, enjoy our lunch and then putter off to do whatever we had planned for the day. We’ve been going to the same location for nearly 4 years now and know the managers and waitstaff really well, and have always been treated like family. They have always taken very good care of us, and we’ve done so in return. Genghis Grill also happens to have an appetizer menu which includes potstickers, edamame and lettuce wraps. I knew before we went in today that I would be able to have something from the appetizer menu, because pre-surgery I’d scoped out the menu and asked Ellen, the woman who normally waits on us about the lettuce wraps. I’d asked how they were prepared, what was in them, and would it be possible for me, post-op, to order just the meat filling? So I knew ahead of time what I would be able to eat. It came out, and it was perfect. She set the bowl of meat and veggies in front of me and it smelled awesome. I breathed in deeply, enjoying the smell and I could taste the umami flavors in the dish on my tongue. Then Ellen said, “How are you going to portion out your meal?” I said that I could really only eat 2 ounces at a time and pointed to the sauce ramekin left on the table. She shook her head and said, “Nah, that’s 3 ounces, let me go get you a 2 ounce ramekin.” and went off to grab one. Now that is service. Seriously. She went above and beyond to make sure that I could still eat on plan and enjoy my lunch. I appreciate that so much! This is one reason you should definitely get to know your waitstaff–you can enlist their help in ensuring you are successful, even when you are eating away from home. And the best part? Leftovers for 3 more meals. I boxed up the leftovers and got to bring home 3 more meals. YES! Ellen sent me home with a little extra sauce that the meat had been cooked with, so I am going to try and recreate this on my own tomorrow with some ground chicken breast and water chestnuts from the store. This made a really flavorful lunch, and was just as good for dinner. Dining out doesn’t have to be something you give up, especially if it is something you did pre-op. Life must go on, and it doesn’t stop just because you had surgery. At least I don’t plan to let my sleeve stop me from enjoying foods away from home. What I do have to do, though, is plan. Preview the menu, if one is available, so that you can see if there will be things on the menu that work with your eating plan. Knowing your waitstaff and managerial staff helps out tremendously as well. Don’t be afraid to ask for substitutions, smaller plates, or takeout boxes. Most importantly, don’t be afraid to ask questions about how items are prepared–many times, the waitstaff will be accommodating and they’ll tell you. You’re not asking for a recipe; you’re just asking how a dish is made so that you can determine if it is something that fits into your plan. These behaviors will help you navigate situations in which you find yourself eating away from home with greater success than if you had just gone in blind. Now next week, when I am traveling away from home, this will be a bit more tricky, but I’m hopeful that the skills I’ve learned along my journey so far will be handy because they sure as hell will be put to the test! This entry was posted in challenges, choices, daily bites, meal planning, planning, post-op, vsg, weight loss surgery and tagged daily bites, dining out, genghis grill, habits of mind, life must go on, plan for success, post-op eating, post-op life, restaurants, she's got skillz, sleeve gastrectomy, VSG, vsg realness, WLS. Bookmark the permalink. You are right. Life goes on. And each person needs to decide what they can control. Some can not control not ordering their old favorites. So they choose not to go out. I use a few bites technique I’ve written about on my blog. It’s how I do it. And I take the box home too. So glad you are giving things a try. It’s how we learn what works. Rock on. Great experience! Knowing your waitstaff is really paying off extra now. Definitely! There’s another place here in town that we like to go where we know the manager and owners, and they have already let us know that whenever we are ready to eat solids again, they’re more than happy to modify the menu items that we can have to make sure they are suitable for us to eat. I appreciate that they care enough to take the time to make sure that our dining experience is a good one.